Whenever we hear of new toys I'm always keen to see how they stand up to the challenge of our hardy boys, Christopher and Danny. The boys play non-stop. For Danny it's all about the chase, he loves when Christopher chases him and tries to get the toy, however small it may be from his mouth. For Christopher, he wants the toy. There's nothing more to it than that, he wants it more than he wants anyone else to have it and as such has mastered how to carry more than one toy at once. Mia only really gets involved in their toy shenanigans if there's a food connection or if she's greeting you at the door. Have we said before how much Mia loves food? Our pet treat cam review last month was pretty much Mia with a cameo appearance from the boys, wasn't it. This month we were given the chance to review a set of toys from the new Busy Buddy treat dispensing toy range shaped like turtles and dinosaurs. 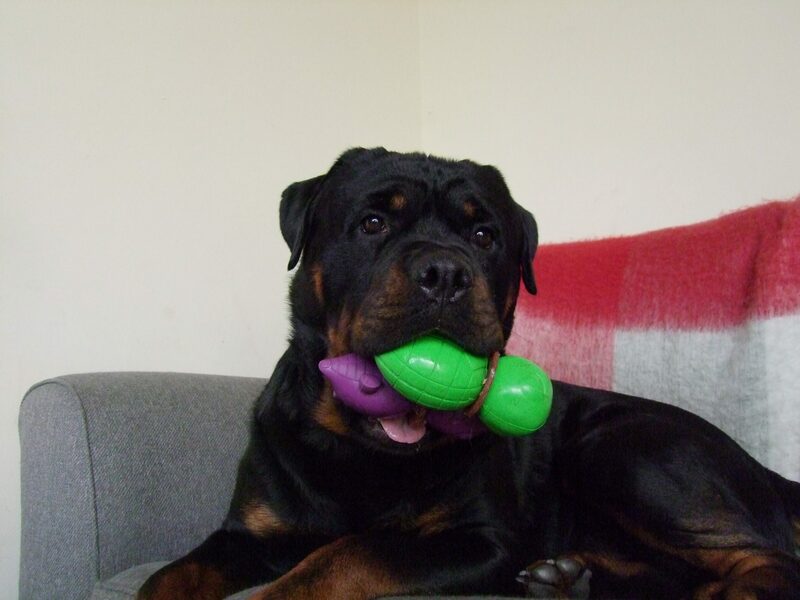 We received two small toys (RRP £6.99) and two medium sized (RRP £11.99). When they arrived, they were fully inspected. Made from vanilla scented rubber and nylon, they're designed to suit dogs who like to chew and with the added treat, make playtime last longer. The rubber also makes them rather bouncy as we discovered when Danny threw his turtle across the floor. Each came with a set of four ring-shaped treats to fill in the middle when ready to replenish. Refills are easy to find when you're ready. The toys hold one treat at a time and you simply twist to take apart the head from the body which exposes the link to slip the treat onto before replacing the end of the toy and twisting to tighten. I found you need to give it quite a twist but it does then keep the treat securely in place. Always thinking about others, Mia would have quite happily taken the toy without tightening it to save me a job. Although only available in two sizes, the small size is ideally suited to smaller dogs, whereas the medium is perfectly suitable for medium to large breeds. After everyone had been given one toy each, they started investigating, smelling (and in Danny's case, throwing) their new toys. Still, one toy hadn't yet been distributed and this caused a distraction much to Christopher's delight as he set about making the most of the distraction by carrying the toys to his 'fort'. Unfortunately, he hadn't banked on the fact that Mia wanted that treat and only that treat would do, and so after a discussion with Danny to assess his interest in joining her heist, she set a plan in motion to make his watchers on the wall tumble, much to his dismay. These toys are a lot of fun to look at but after a few days, Christopher had chewed part of Barney (the purple dinosaur) almost eating the rubber spikes and Leonardo (the green turtle) soon followed. Other toys from the Busy Buddy range, such as the Bristle Bones are most definitely better suited to dogs like Christopher. Two years later, we still have those intact, except for minor chewing so I can safely say they stand up to the hardiest of chewers. For dogs who aren't as tough chewers, like Christopher, I have no doubt they'd last longer.